Thomas David Heaton is a English professional footballer who played as a goalkeeper in the England junior national team for a very long period and is currently playing for their senior team. He has played for some popular clubs during the course of his career, some of them are - Manchester United, Swindon Town, Royal Antwerp, Cardiff City, Rochdale, Queens Park Rangers, Wycombe Wanderers and Bristol City. He is currently associated to the popular first tier Premier League club, Burnley FC. Born on 15 April 1986 in Chester in England, Heaton started his youth career while playing for a local club - Wrexham. After few months in the Wrexham setup, he switched to the youth academy of Manchester United for 2 years. In 2003, he was signed by Manchester United as a professional player for a contract till 2010. But most of the time he was on loan to other clubs of the English Premier League. At first he was loaned to Wiltshire based club, Swindon Town. He played over 20 matches for the club, saving a penalty on his debut. He was loaned to Royal Antwerp for the season 2006 but didn’t made any appearance. The following season he played for Cardiff City. Due to his sharp skills and dependable tactics he soon became a first choice goalkeeper for the club and played 21 games. On 15 August 2009, Heaton was signed by Queens Park Rangers on an emergency three-month loan deal. The only match he played in was a 1-0 defeat against Chelsea in League Cup. Heaton switched from QPR to Rochdale for the remaining season of 2009 and conceded only 10 goals in the 14 appearances that he made for the club. He played for Wycombe Wanderers for the season 2010 and played in 16 games. After being released by Manchester United, Heaton again returned to Cardiff City at the end of 2010 for a 2 year deal. He was instrumental in many victories of the club, some of them are - crucial penalty heroics against Crystal palace and Liverpool in the group stage and again in League Cups’ semi-final. In 2012, heaton signed a 1 year deal with Bristol City and made his debut on 18 August 2012, in a 1–0 defeat away to Nottingham Forest. The following season, he was offered a 2 year deal by Burnley. 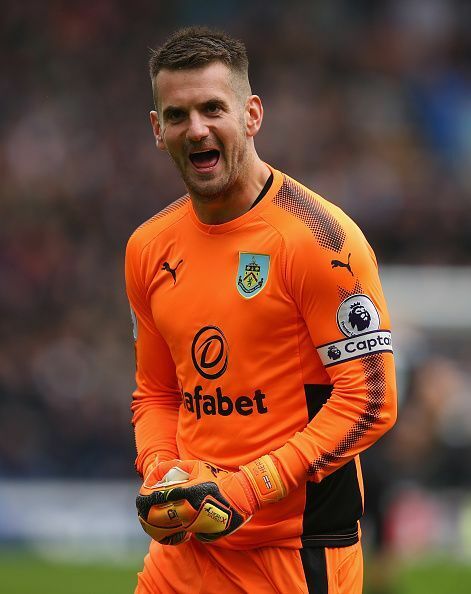 Due to his incessant improving performance, he was made club’s captain for the season 2015-16 was voted by his teammates as Burnley's Players' Player of the Year. He made 169 appearances for the club and led the team to be promoted to the Premier League. Heaton's performances during the 2010–11 season earned him the Cardiff City's Young Player of the Year award. Heaton was a part of Burnley's defense which allowed only 37 goals, the fewest in the league in 2013. Heaton also picked up 19 clean sheets, the most by any keeper in the regular season. Heaton was first included in the junior national side in 2001 and played 4 games. He went on to play at various age levels for England and eventually earned his place in the senior. He made his senior debut in a friendly against Ireland. He further played in UEFA Euro 2016 qualifying match against Slovenia and in Euro 2016 warm up against Australia.